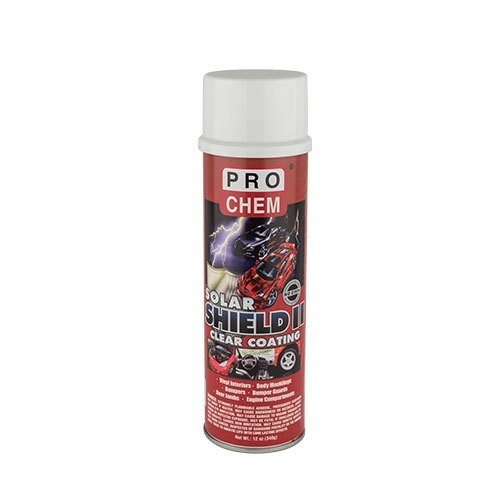 SOLAR SHIELD II | Pro Chem, Inc. SOLAR SHIELD II is more economical compared to higher priced coatings. It is fast acting and easy to use. Vinyl and plastic surfaces are renewed and illuminated for a brighter finish. No wiping necessary. The fine aerosol mist is ideal for hard-to-reach places to provide an even coat. SOLAR SHIELD II is a clear, foamless coating that leaves a water-resistant glossy shine. Shake well before using. Prepare surface by removing dirt, dust, oil and grease. Dry surface. Hold can 10” to 12” from surface. Use a stroking motion, apply two or more thin coats rather than one heavy coat. For best results, spray at 70°F to 80°F. Polish surface, if desired, using a soft cloth after allowing spray to dry a few minutes. *Test spray on an inconspicuous area or scrap piece to check compatibility.